Thus Jim Crumley concludes this remarkable book of nature writing. The setting is largely Highland Perthshire (there are startling asides to Mull and Alaska), the author's home for several years, and where, having 'chased a rainbow' that faded early he stayed on and put down a root that nourished his nature writer's instincts. Something Out There is Jim Crumley's account of his quest to rediscover something of the ancient bond between man and nature. It is told in prose that is three-quarters of the way to poetry, and in the process gives the art of nature writing a bold new standard bearer for the 21st century. Jim Crumley is a nature writer with almost 20 books to his name, mostly on the landscape and wildlife of Scotland. He is renowned for his style: passionate, inspiring, visionary, sensitive, moody, majestic%85no work of his should be missed. He is also a columnist and presenter of radio programmes. 'This author is never less alone than when by himself. Home may be a remote cottage in Glendochart, but the world beyond its windows teems with life. Everything that moves, be it eagle, buzzard, raven or redwing, even the fieldmouse in his dyke, is observed, mulled over and recorded. That sounds fairly clinical. Crumley's prose is anything but and frequently the lyrical quality and poetical imagery is profoundly moving. He has the ability to take the reader with him on his travels, to make us see with his eyes, listen with his sharp ears, share his quest for answers. Why does the eagle behave that way, or the salmon that? How does the osprey catch fish in a snowstorm? ... Read his account of the northern lights and it won't matter if you never see them. His word pictures of red, dervish dancers, of light pouring in cataracts of green, yellow and white, are vivid enough. His world is one where silence is important, an enquiring mind even more so. A beautifully produced book which includes both poetry and black and white photographs. 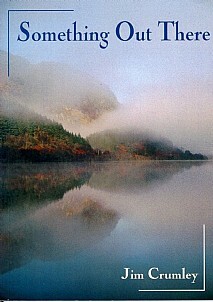 Not for nothing has Jim Crumley been called the best nature writer in Britain'. Leopard Magazine. 'This is a celebration of the natural world as seen through the eyes, ears and heart of a skilled writer. He can describe the flight of the skylark in exquisite language and point out that the call of the cuckoo can sometimes sound like jazz. He can write pages on the colour of an egg or the scent of pine trees, or the life to be found in a drystane dyke and not one word will be dull or misplaced. Jim Crumley now has almost 20 books to his credit and, in my opinion, Something out There is his best.' The Scots Magazine. 'Jim Crumley, like all the best nature writers, combines his extensive knowledge with respect and awe for the natural world. He brings a soft-voiced poetry to his observations of nature's daily dramas, and the sort of imagination that can cast itself inside the egg of a dipper or the mind of a hunting hawk'.The Herald.